Miniture Tote Bag of Blooming Flower Tea comes in a green tote bag with a red pouch inside. The red pouch contains 3 blooms of different flower tea. 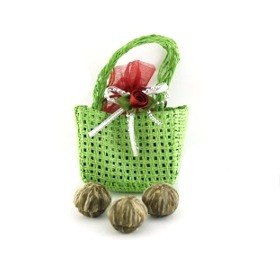 Hand picked premium white tender tea buds and top two green tea leaves, are hand sewn into bundles or rosettes with cotton thread by artisans in various regions of China. When steeped in hot water, these rare flower tea slowly blossom into breathtaking flower shapes or jewels. The tea liquor releases a myriad of flavors from sweet and subtle to rich and bold. Why send traditional roses? Get them this blooming flower teas. Healthy yet exquisite. This Miniture Tote Bag of Blooming Flower Tea is an unique gift set!